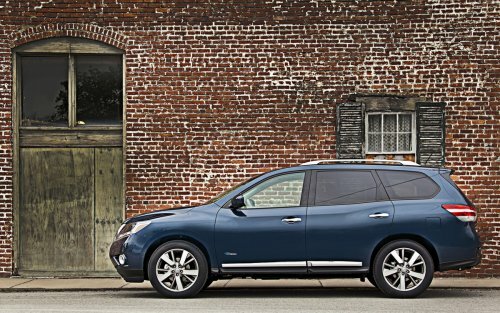 Nissan has announced pricing for the 2014 model year of the Pathfinder SUV. The 2014 Pathfinder began entering sales floors earlier this week and is available at dealers nationally. With the 2013 model year refresh, Nissan saw Pathfinder sales increase by 201 percent over the previous year and plans to continue those phenomenal numbers with the introduction of both a strong lineup and a new hybrid option. MSRPs remain on par with last year. The 2014 Pathfinder is available in four model variants in either two-wheel drive or four-wheel drive. All are powered by a 3.5-liter six-cylinder engine and the most towing capacity in its class along with best-in-class fuel economy in its 2WD base model. The Manufacturer Suggested Retail Price for the Pathfinder S 2WD base model is $28,700 plus destination. Adding 4WD boosts the price tag to $30,300 plus destination. The Pathfinder's best-selling model is the Pathfinder SV, which in 2014 will start at $31,960, plus destination, and jump to $33,560 in its popular 4WD model, destination not included. In the high SL trim, the 2WD Pathfinder is $34,900 and the 4WD is $36,500 plus destination. This can be upgraded with a Tech Package which includes a Bose premium sound system. Finally, the top-level Platinum model Pathfinder begins at $39,600 and goes to $41,200 plus destination for the 4WD option. Part of the Pathfinder's success has been the new Intuitive 4WD shifting and the selection dial for easily choosing 2WD and 4WD Lock options for the drivetrain. Setting the dial to Auto mode allows the Pathfinder to choose which is required for any given situation with on-the-fly shifting taking place at speed. Fuel economy in the base model 2014 Pathfinder S is 20 mpg city and 26 mpg highway, for a combined 22 mpg. The 4WD model S loses about 1 mpg, bringing 19 / 21 city/highway. The 2014 Pathfinder is poised to continue to be one of the fastest-growing sales models in the 7-passenger SUV market. Later this year, a Hybrid model will be offered. It is expected to boost fuel economy by several points, especially for city drivers.